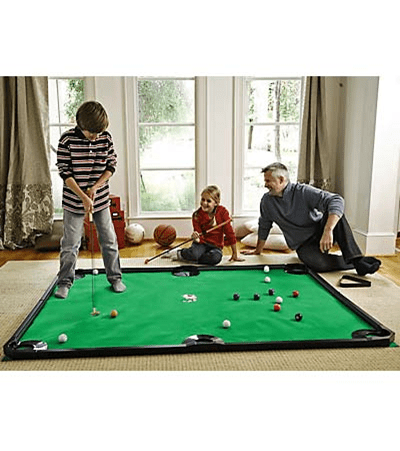 Homemade “Putting” Green–Idea Stage | Who Are You Calling Crafty? T’was six days before Christmas and my five year old says, “I want Santa to bring me this.” She shows me her “Santa Wish List” she made in school. I found the Putting Green on Hearthsong for $75 – REALLY $75 for that???? As one of the hard working elves my heart just sank. My first thought was what the hell is that and the more I read the more I was like… um NO! I am NOT letting my five year have “real golf balls and clubs” in my house. Also we don’t play golf but I decided to modify this game and pull something similar off six days before Christmas. I have a gaggle of felt left over from my epic venture – my son’s felt play tent. I figured what else am I going to do with it? So the more I think about it the more I think I an actually pull this off before Christmas. For example: “golf balls” = ping pong balls, “real putter” = dowel covered in felt with a poly-fil end, the rails either dowels or PVC pipe thread through pocket like a curtain rod through curtains. I have no idea if this is going to work or if it will be an EPIC FAIL project but I hate disappointing my kids so it is worth a try. There are a couple of downsides to this project: one – I have to go to the store to get dowels and two – this is all I have been thinking about so until it is finished my brain can not function or focus on anything else.